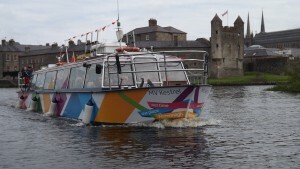 The MV Kestrel Waterbus is a 56-seater, fully glazed, traditional waterbus based at Brook Park in Enniskillen. Erne Tours run guided public and private tours from March to October of the Historic Island Town of Enniskillen and Devenish Island Monastic Site. Relax and enjoy the panoramic view as your Boat Master delivers a live and entertaining commentary. Your cruise will take you along beautiful unspoilt waterways passing alongside historic landmarks such as Enniskillen Castle, Portora Royal School and Boat Club, Old Portora Castle, Waterways Ireland Headquarters, Cole’s Monument. Check out the abundance of waterside wildlife and see if you can spot the fast and colourful Kingfisher as it flies low to the water near the nesting site. Admire the skill of the crew as they safely navigate you through the lock gates at Portora and on towards Devenish Island Monastic Site on Lower Lough Erne. Once moored at Devenish Island you can disembark for 40 minutes and learn about its history dating back to the 6th Century, including the best preserved Round Tower in Ireland, Augustinian Abbey, church ruins, ancient graveyards and high cross. There is also a small museum and toilet facilities. Or simply just relax on board and avail of the fully licensed bar serving cold drinks, tea/coffee and snacks. There is a toilet on board for your comfort. The MV Kestrel can cater for visitors with limited mobility. There are some steps on and off the vessel. The crewmembers are more than happy to assist where needed. Wheelchairs can be brought on board with help from staff. Dogs are welcome, but must be kept on a lead at all times both on board the boat and at Devenish Island. On hot summer days, be advised the temperature under the glass can get quite warm so may not suit some animals. Please ask advice if you are planning to bring your pet.